Built in 1858 the Safford House is one of the last high style homes built on High Street in the 19th century. The India Street neighborhood is a small area between the densely-developed Old Port and downtown districts and the primarily residential neighborhood of Munjoy Hill. Large portions of the neighborhood were lost during slum clearance projects and the construction of Franklin Arterial in the 1960s and 1970s. Located on a point of land that served in the early 19th century as a hub of barge and boat traffic on the Cumberland and Oxford Canal, the remaining historic structures at Thompson’s Point are related to its use as a train repair and storage facility in the second half of the 19th century. House Island is one of the most important historic landmark sites and cultural landscapes in the City of Portland. Its location at the center of the harbor, its significance in national and local history, and its importance to both the built and natural environment make it a top priority to preserve. The former Maine National Guard Armory is a gateway landmark that provides a striking visual introduction to South Portland at a key intersection with 30,000 cars passing by each day. When the City of Portland announced it would close the 1907 neighborhood school and construct a new building outside the neighborhood, Landmarks, Maine Preservation, and the National Trust for Historic Preservation commissioned an alternative study for the school's reuse. Built in 1868-72, the United States Custom House on Commercial Street was listed on the National Register of Historic Places in 1973 and is designated as a city landmark. Following the removal of the U.S. Customs offices to other office space in Portland, the building underwent a comprehensive restoration to correct water damage. Landmarks supported the Friends of Eastern Promenade in their efforts to restore the park's essential character-defining details, while accommodating modern memorials, universal access, and amenities. 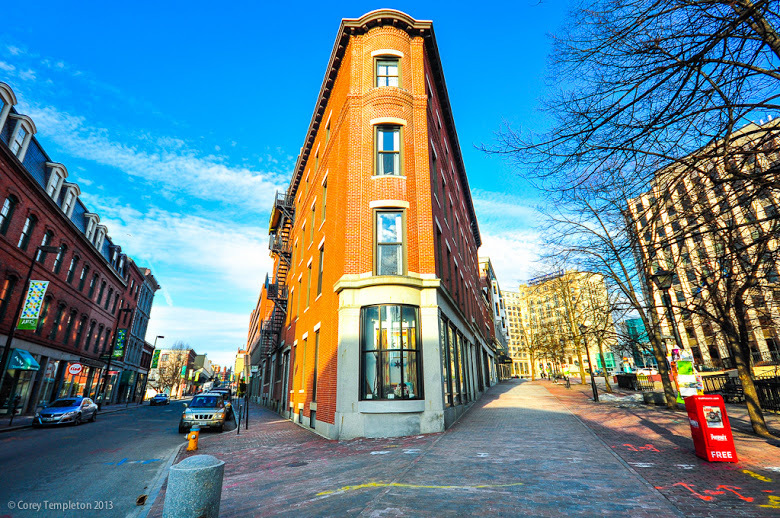 When the Portland Press Herald and Maine Sunday Telegram vacated their 1923 building at the corner of Exchange and Federal Street, as well as the 1947 addition on Congress Street in 2010, the empty building in the art of the Congress Street Historic District was in need of a new use. Advocating for new construction that is contextually appropriate in historic areas is an important part of Landmarks' mission. A four story residential building with thirty-nine apartments and a thirty-four space parking garage was proposed for a partially empty and neglected corner in the West End Historic District. Prior to the design, a historic dwelling located on the lot was reclassified from a contributing building to non-contributing due to its deteriorated state. The Twitchell Champlin Building (1884-1924) was a former spice mill and canning plant. After its industrial use ended, the building was altered for use as a cold storage building. That use lead to a deterioration of its masonry walls. The Etz Chaim Synagogue was founded at a time when Portland’s Jewish population was concentrated on the peninsula. As congregants moved to Deering and the surrounding suburbs in the second half of the 20th century, attendance dwindled. The remaining congregation struggled to maintain and heat the historic building. In the 1990s the Maine College of Art (MECA) took a leap of faith and acquired the Porteous Building. 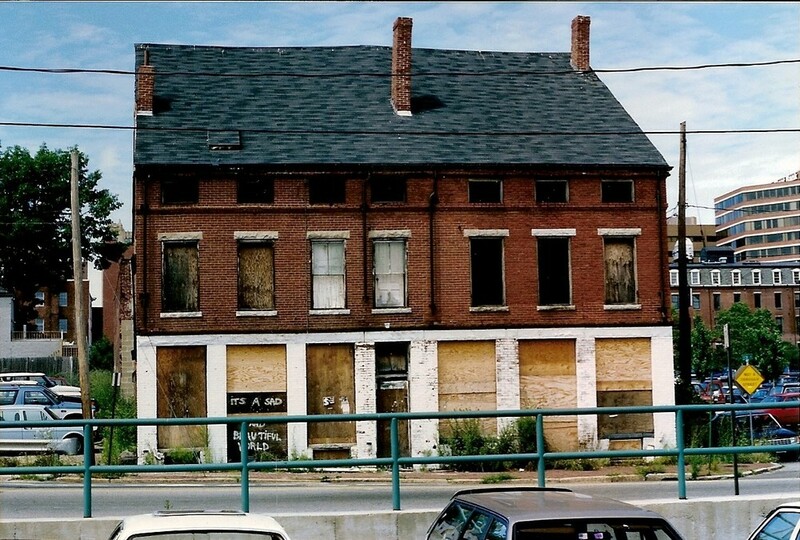 MECA began the process of rehabilitating the former store and consolidating its programs into this prominent site. In 1990 the building was listed as a local historic landmark and became a landmark building in the Congress Street Historic District in 2009. John Coleman of the Via Group, a nationally prominent marketing firm, recognized the potential of this landmark building for reuse as modern offices. Formerly the Chestnut Street Church (1836) the building is one of Portland’s few surviving examples of early Gothic Revival architecture. It is also one of the few surviving examples of the work of Charles Alexander, one of the most accomplished local architects of the 1850s and 1860s. Martin’s Point Health Care, Maine’s largest primary care practice, needed to improve efficiency and comfort for its growing number of patients. The health care campus dates to the 1700s when it was established as U.S. Marine Hospital. When the state vacated the former Maine Youth Center, the re-use of the 60-acre campus was a daunting task for any developer. Converting the former institution for troubled youth, with its bleak and negative associations was a big challenge. In addition the campus has several unusual neighbors like the Long Creek Youth Development Center and the Portland Jetport. Named after Herman Kotzschmar, a German immigrant who became a leading musical performer in early 20th century Portland, the organ was installed in City Hall Auditorium in 1912 as a gift from Cyrus Curtis. The Park Row townhouses at 88-94 Park Street were listed in the National Register of Historic Places in 1972. One of the character defining features of this distinctive collection of row houses is the cast iron balcony grills above the elevated first floor entries. In 2013 the buildings were listed in the National Register of Historic Places for their architectural and educational significance as well as their association with Westbrook’s Franco-American community. Built in 1887, the Samuel Trask Block at 393-395 Spring Street was designed by Francis H. Fassett and Frederick A. Thompson. The two-and-a-half story house is Queen Anne in style with brick, wood, stone, and terra cotta details. The building is located in Portland’s Spring Street National Register Historic District. A multi-year plan restored the flat iron front and the Free Street elevation. Although small in scale and budget, the exterior restoration of the Lower Hay Block significantly improves the character of the historic building at the pedestrian level. While protesting the demolition of large numbers of historic properties necessitated by the Gruen plan, Greater Portland Landmarks organized to save the John J Brown House in 1971. In 1990 the City of Portland adopted a comprehensive historic preservation ordinance protecting historically and architecturally significant buildings, landscapes, and sites from demolition and provided review standards to ensure compatible changes. The Maine Rehabilitation Tax Credit promotes investment in rehabilitating historic structures for commercial purposes. The economic and fiscal impact of the Maine historic tax credit program has been has been widespread and includes small projects like storefront restorations to the rehabilitation of large textile mills.